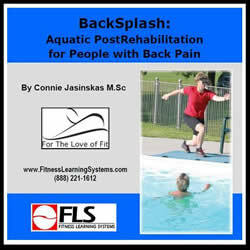 This course shows how vertical aquatic exercise can be used in post-rehabilitation for back pain by aquatic rehabilitation practitioners, aquatic personal trainers and aqua fitness leaders providing individual or group exercise for this population. Videos and pictures give you a clear understanding of the exercises and progressions shown in the course. If you want to get exceptional results with your back pain clients, this course is a must. Understand common causes of back pain and back injury issues. Know common steps to reduce back pain and the phases of recovery and care for a back pain client. Learn the recommendations for back pain recovery and how aquatic exercise can play a role in this process. Understand core training strategies for a back pain client. Learn how to teach abdominal bracing and core stabilization in the aquatic environment. Understand power posture progressions in the pool. Identify equipment that can be used for training the core and back in the aquatic environment. Learn and practice aquatic core exercises including prone aquatic plank, gait training techniques, anchored stabilization work, powerful stillness, partner work, and cardio and core concepts.